Between texts and tweets, memes and microchips, we’ve become great at breaking the world down into byte-sized bits. In the process we’ve stopped seeing the forest for the trees, never mind the root system that connects them all. In Connected, Tiffany Shlain—award-winning filmmaker and founder of The Webby Awards–sets out to explore these bonds with the help of her father, acclaimed author and thinker Dr. Leonard Shlain. When the unexpected happens during the making of the film, Tiffany is forced to reexamine everything she thought she knew about life, relationships, and connectedness. Tracing interdependence through history, she discovers the surprising links between right brain and left; alphabets and power; honey bees and stress; hormones and happiness; technology and nature; progress and consequences; and parents and children. The result is a personal film with universal resonance that encourages viewers to make connections of their own. Based on supplied photoshop file, we created this custom facebook tab using wordpress. Every section is easily changeable by Connected using the backend system we built. 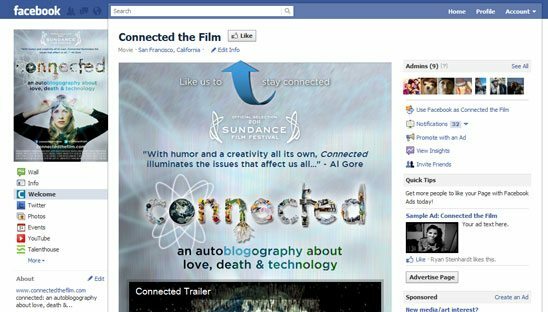 You can view the Connected Movie Trailer on the tab.